At the JEC Show in Paris, Fill illustrated how productivity and process reliability can be increased massively. Industrial series production opens up new opportunities in lightweight construction. Fill the mechatronics company automates composite production. The Upper Austrian machine-building experts presented their latest developments at the JEC international showcase exhibition from 11 to 13 March. From the laying process for dry knits to automation of ultrasound applications and extending to CNC X-ray inspection systems for large components. 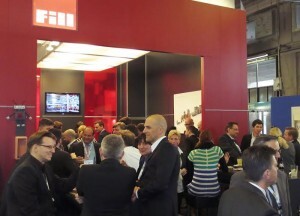 The Fill exhibition stand, with its integrated cocktail lounge, was a very popular meeting place and communication platform for the international plastics industry. Paris/Gurten, 18 March 2014 – Lightweight construction is the megatrend in the industry. Due to their unique combination of low weight, high strength and durability, components made from composite materials are already employed widely in aircraft and wind turbines. Their use in the automotive industry is also increasing rapidly. Composite materials could be employed even more widely if the complexity and time involved in developing and producing the components were to be reduced. Fill Machine Engineering is pursuing precisely this goal with the automation of production processes. “Companies will only achieve a new performance level with their products by means of advanced automation solutions tailored to the industrial requirements,” explains Wilhelm Rupertsberger, Manager of the Plastics Competence Center at Fill. The focus of Fill Machine Engineering lies in project management, development and production of machines, and integration of the individual components – from quality control to commissioning. “We see ourselves as a systems integrator who also plays the part of general contractor when required. Our highly automated manufacturing processes with integrated quality assurance and process monitoring supply our customers with a real competitive advantage,” says Wilhelm Rupertsberger. Fill is also intensively engaged in the areas of energy efficiency and the responsible use of resources. “Competitiveness always comes first for a company. Resource efficiency plays an important role in this, bringing sustainable competitive advantages,” says Fill CEO and proprietor Andreas Fill. His company has repeatedly acted as a pioneer and a multiplier in this field. In spring and autumn 2014, the “Innviertel VDI Dialog” will be staged for the third time at the company site in Gurten, Upper Austria, within the framework of the “Fill Academy”. At a total of four events staged jointly with the German Engineers’ Association (VDI), high-ranking experts will discuss technological approaches to industrial sustainability. Fill is a leading international machine and plant manufacturing company for diverse branches of industry. The family-owned business excels in the use of the latest technologies in management, communication, and production. Business operations encompass the fields of metal, plastics and wood for the automotive, aircraft, wind energy, sport and building industries. The company is the global market leader in ski and snowboard production machines and aluminum core removal technology. Andreas Fill and Wolfgang Rathner are joint CEOs of the company founded in 1966 that is still completely family-owned. The company became a public limited company (GmbH) in 1987, was certified in accordance with ISO 9001 in 1997, and now has more than 590 employees. In 2013 the company`s turnaround amounted to nearly 115 million Euros.